I have a husky that like to go down into my carpeted basement and make a mess. For the last few years, to keep her out, we’ve had a baby gate over the doorway that is tacky and inconvenient. After looking around and not finding anything close to what I want, I decided to make my own half door. I wanted it to be open and not impede the flow of air and sound from the upstairs to the basement. I also wanted it to match the pillars we have framing the TV. With only a sheet of 3/4” birch plywood, some 1\2” MDF and a few dowels, this is what I came up with. Check out the build video. -- - I learn more from my failures than my successes. Nice solution. Way better looking than a baby gate. 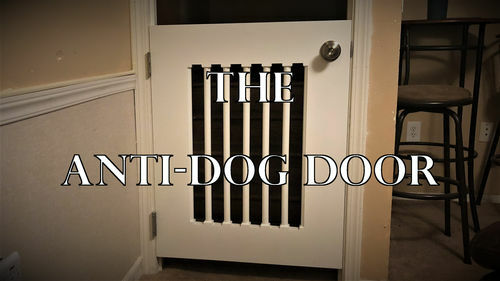 i did the same to keep my beagle out of the kitchen,all the baby gates were very poorly made and ugly.nice job on yours matt. Very nice. I need to make one for my beagle. Her name is Khaleesi and you are correct about the demonic possession. She has eaten several couches and other possessions. She is four, going in five and is starting to calm down. 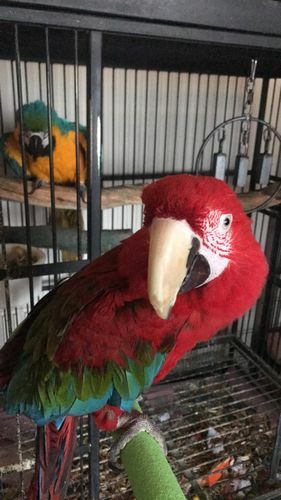 The biggest issue is when she is locked inside too long she pees on the carpet in the basement instead of the hardwood or tile upstairs (or just hold it). Now it’s a non-issue. Huskies just take longer to grow up. They’re too smart for their own good and don’t care about punishment. Just wait, you’ll have a good dog in 3-5 years. Awesome Gate, I like it! sounds a lot like our beagle,too smart for her own good.and yeah doesn’t really care about punishment,she knows when she’s bad but turns right around and will do it again!she just turned 2 and is getting better though.i think the dog is half cat,loves to climb-lol. Khaleesi sounds like my sister’s Husky (Rana) – who is gone now but lived a long happy life full of mischief and mayhem. She actually enjoyed thunderstorms – most dogs hide but Rana liked to lay in the middle of the yard and watch the lightning (I always said she was waiting for her mothership to return). She never destroyed a couch, but managed to destroy a chair while securely locked in her crate, she loved to eat plastic – from biting the buttons off a flannel shirt (but otherwise not damaging the fabric) to chewing up several garden hoses and a vinyl beanbag chair – yet it never caused any digestive problems. When scolded for misbehavior she would howl – once while dog-sitting (demon sitting) she howled at me and I howled back – THAT got her attention – she sat down, her jaw dropped open, and she blinked at me for several seconds as if totally stunned – then she threw back her head and howled again – I howled right back. I don’t know what I said in her language but it worked and from that point on she never did anything bad in my presence (but everyone else was fair game). Since then my sister has had terriers – all of them know that I bark back. Thanks for sharing, I’m sure this one is going to get copied.